DO YOU WANT FLOSS WITH THAT? What fast food can do for dentists! What can the fast-food business model do for dentists? I had an interesting conversation with one of my coaching clients last night – a new dentist in his first year of practice. He is working as an associate 3 days per week in a busy, thriving practice in the Midwest, as well as assisting at the university dental school. He has an opportunity to fill in his week working in a corporate dental practice and we explored his expectations about working in the corporate environment.This was of particular interest to me as I am currently preparing a presentation I am planning to take on the road about what private dental can borrow and gain from the efficient business world of franchise. I am not talking about franchising your practice, and I’m not even tapping into the knowledge of existing dental franchises; my ‘golden nuggets’ for dentists to use in their practices come from the best of what works in the fast food industry to make running an operation smoothly, successfully and profitably. I am morphing these tidbits into VALUABLE & USEFUL tips that will make dentists lives easier. Dentists tell me they ‘just want to do dentistry’. How can you do that and run a practice? By emulating a business model of tried and true systems that essentially run themselves. for another dentist to run, what would you leave in about how you do things in your practice? What would you take out? How would you describe how you do things? What is your patient’s experience from the moment they walk through the door? How do you retain patients? How do you train your staff? How do you monitor their progress and keep them motivated? How do you schedule your day? How do you maximize profitability? What do you want people to say about your practice? What do you want your practice to look like in 5 years? Food for thought (pun intended)! Watch in the next weeks as I elaborate on each of these ‘Golden Nuggets’ – gems that will give you tangible things you can do to make your practice run smoother and more efficiently, so that you can spend more time practicing dentistry instead of managing your practice! DO YOU WANT FRIES WITH THAT? What fast food can do for dentists! I had an interesting conversation with one of my coaching clients last night – a new dentist in his first year of practice. He is working as an associate 3 days per week in a busy, thriving practice in the Midwest, as well as assisting at the university dental school. He has an opportunity to fill in his week working in a corporate dental practice and we explored his expectations about working in the corporate environment. This was of particular interest to me as I am currently preparing a presentation I am planning to take on the road about what private dental can borrow and gain from the efficient business world of franchise. 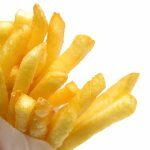 I am not talking about franchising your practice, and I’m not even tapping into the knowledge of existing dental franchises; my ‘golden nuggets’ for dentists to use in their practices come from the best of what works in the fast food industry to make running an operation smoothly, successfully and profitably. I am morphing these tidbits into VALUABLE & USEFUL tips that will make dentists lives easier. Dentists tell me they ‘just want to do dentistry’. How can you do that and run a practice? By emulating a business model of tried and true systems that essentially run themselves.